Any further info you need, just let me know. In the meantime, any chance of the type codes from the drone helis? Keen to fix the matches for the downtown helicopters. Jamie, you can see the type codes by using the online map and enabling the display of drones. Then you can click on any aircraft and see its type. They're all Jet Rangers (B06) if memory serves. Brill, didn't know I could do that. Keith Smith wrote: Wow...when did this get so broken? I'll go back and retest when able. Was this in FSX or P3D? It's been a while, Keith. I remember back when you and I frequently manned the scopes together late night, I had the conversation with you about this issue. Then I switched to x-plane primarily and didn't think much more about it. Marcus Becker wrote: Then I switched to x-plane primarily and didn't think much more about it. That seems to be the most oft heard refrain on the PE boards. I bought X-Plane and it's amazing how much better it is for sim flying. I miss the A2A aircraft on the platform, but frankly, X-Plane "just works" even without the add-ons. Plus World Editor for free and supported by Laminar means that scenery will never be a problem. The one thing I miss are these traffic files from the FSX/P3D world. Edited to replace file link, the original seemed to have been corrupted. Thanks for the great your works. I just bought it MyTraffic 6 today and Installed. also I am using a FSX SE with WIN7 64bit. I have a questions for that your Installtion guides. 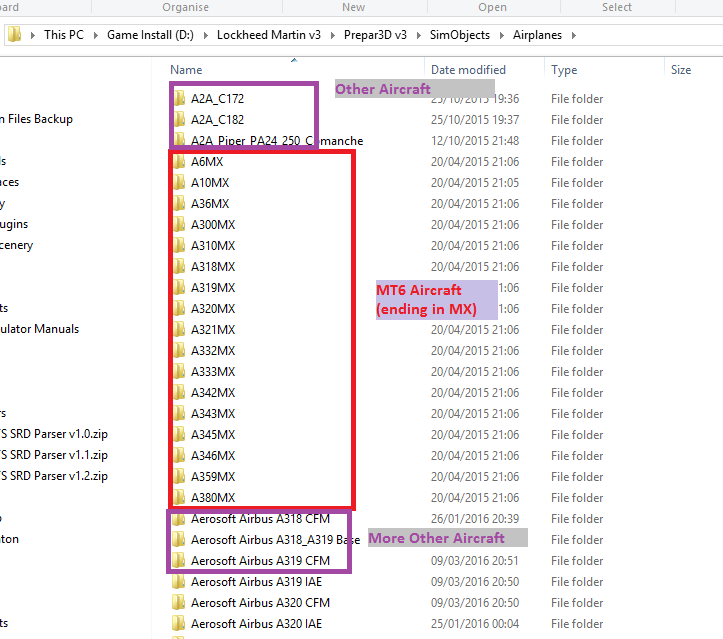 [MyTraffic Installation Directory]\Aircraft : It is means just copy to Aircraft folder in whole? Paste them all into your Prepar3D/FSX folder under [P3D/FSX Installation Directory]\SimObjects\Aircraft : It is means that Aircraft folder to the Paste in the FSX Installation Directory]\SimObjects\? Unzip "pmt6.smx" and place it in ..\Pilotedge\aircraft folder. : It is only for the FSX or FSX SE? because there your links also .smd but I don't knew about of that file. your Matching Files will be also It is matched of the Drones with MT6? or Needs to the Modify? It is also C172 models matched to the FSX SE Default C172 Model? As for files, .smx is for FSX, .smd is P3D. They are the same file with minor tweaks as P3D does not include a stock C172. If you follow steps  and  correctly in the install instructions, the drones should be replaced with appropriate matches, at least for those aircraft included in MT6. I don't have FSX to test it, but it *should* match the default 172 to any small Cessnas, it's only P3D where I don't have a default C172 to match it with so I substituted the 150. I did test of them, however there is neeeds to some change folder name. when I try to your guidences then start to FSX Steam Edition and as shown Error pop screen. There are multiple objects with the the same title name. They must have unique title names. That is not only A10MX. I did changes of the that MyTraffic Professinal\MyTraffic\Aircraft folders rename to MyTraffic Professinal\MyTraffic\Aircraft_BAK then FSX SE is started to Normal. I don't know other systems, because I am tested with WIN7 64bit with only the FSX SE. anyway, That is working well, I check with the Live map for Drones locations. First time, I did test in the L52 Airport and BE58 is Instead of BE55. and other BE55 aircrafts not to BE58 but King air 350. B1 and F15 is corrected of these models to the Live map. also I will tested other airport then Cherokee 180 is Instead of PA46 and BE55 is like working that in the L52. some of BE58, a King air 350. Thanks for your great work again. This link is expired. Can I have it again please?